I’ve been getting eggplant in my farm share (ir)regularly and though I’d take a shot at baba. 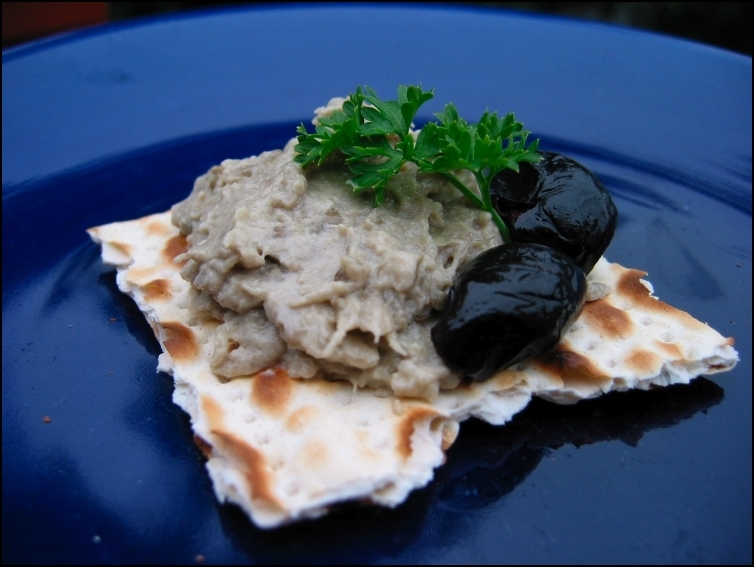 I recall enjoying the dish when I was a kid, but on my second trip to Israel, when I worked as a volunteer, we were fed eggplant (usually roasted and mashed in some baba variant) just about EVERY meal EVERY day. After my return, I found myself unable to touch the stuff for years. I gradually worked my way back, starting with roasted, fried, and various curries, finally got to the point where I could eat baba, but it took quite a while before I could actually enjoy it. This represent the final milestone achieved: I actually made my own baba and enjoyed it. Only took me 15 years. Brush the eggplant with a little olive oil and salt, pierce several times with a work, and roast in a 375Â° oven for 45 minute, or until the skin blackens and the insides are very soft. The skin should come off easily. Mash the eggplant innards in a bowl with the tahini, garlic, lemon juice, and seasoning. Taste, and add more of each as desired. Baba can be eaten immediately or refrigerate a few hours to overnight to allow the flavors to marry and deepen. Serve with olives and parsley. Drizzle with olive oil if desired.